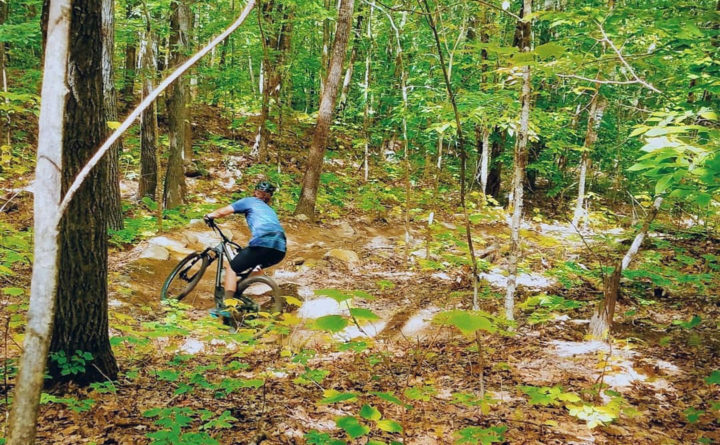 Jake Cardello takes a spin on a trail cut into land owned by Great Pond Mountain Conservation Trust in Dedham. A group of volunteers is working to turn Orland’s Great Pond Mountain into something of a mecca for mountain bikers. 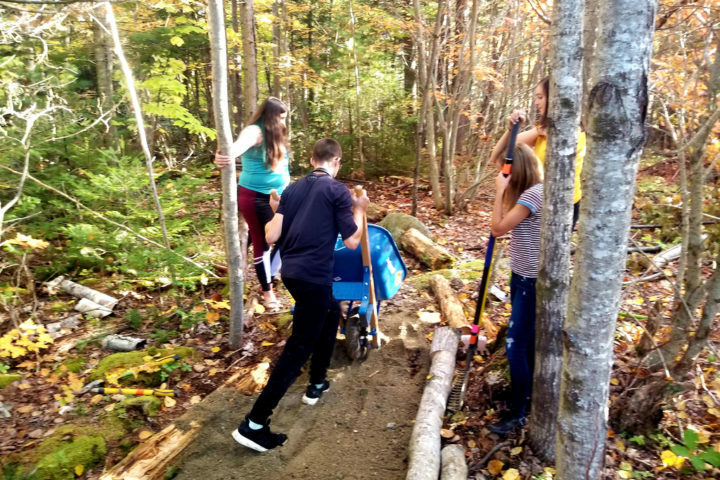 The Great Pond Mountain Conservation Trust and Penobscot region chapter of the New England Mountain Bike Association have finished a 530-yard, single-track trail on the trust’s 4,500 acres in Orland off Route 1 near its intersection with Route 176. They hope to build a 3-mile trail in the same area starting in June, said Shawn Mercer, the trust’s land steward. The goal: to eventually build what could be the first extensive mountain-biking trail system in Hancock County — three trails each about 3 miles long — without disturbing the trust’s more sensitive lands or the hiking trails that for decades have annually drawn several thousand hikers to the mountain, Mercer said. There are easily more than 100 trails in the Bangor area, but the opportunities in Hancock County are limited, said Craig MacDonald, president of the Penobscot region chapter of NEMBA. Volunteers help build a mountain biking trail cut into land owned by Great Pond Mountain Conservation Trust. A “single-track” trail is wide enough to accommodate a bicycle or hikers and skiers. A “double track” trail is wide enough for an ATV or Jeep, MacDonald said. Economic-impact surveys differ, but most agree that with bikes costing anywhere from a few hundred to tens of thousand of dollars, mountain bikers spend some cash. According to a Singletracks.com survey of more than 1,400 cyclists across the country, 62 percent of mountain bikers travel to ride, make an average of two trips a year, and spend an average of about $382 per trip. Some towns, including Crosby, Minnesota; Oakridge, Oregon; and Copper Harbor, Michigan, have retooled their economies around mountain bikers by building vast networks of trails for them. No one expects that kind of return immediately from the Orland region, but trails there could complement the multi-use trails at Acadia and efforts to revitalize neighboring Bucksport. The mountain is a good place for mountain-bike trails, MacDonald said. Topping off at 1,020 feet above sea level, Great Pond Mountain is the tallest and most prominent mountain in the 4,300-acre Great Pond Mountain Wildlands in Orland. The area is home to a network of hiking and multi-use trails. The Great Pond Mountain Conservation Trust acquired the land in 2005. The culmination of two years of discussions, the 0.3-mile loop NEMBA and the trust constructed last year took from May to early November to build. An all-volunteer effort, it cost almost nothing to make, Mercer said. The small trail built last year was an important test for NEMBA and the trust. Both learned how to build a good biking trail while assuaging trust members’ and hikers’ concerns that bikers would be disruptive, Mercer said. The 3-mile trail they hope to build this summer will cost money ― exactly how much is uncertain, Cardello said. His chapter secured a $10,000 grant to build the trail, which will require the aid of professional trailmakers. They are seeking donations to pay for the rest of the work. The volunteers hope to enlist riders from Bucksport High School and Down East Family YMCA in Bucksport and Ellsworth to help this summer, Cardello said.